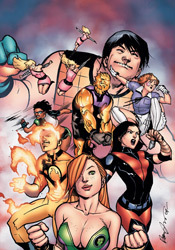 There’s a natural rivalry brewing between the members of Gen13 and their apparent successors, Gen14. Only natural that the younger squad would be in a hurry to take over, while their predecessors would take offense to being replaced before they’re ready. After coming to an uneasy understanding, uniting to confront their would-be masters in the US Military and making a long journey to the city of Tranquility in the hopes of finding kindred spirits, the teams were met by an unsightly surprise. Tranquility, thought to be home to dozens of retired or inactive super-heroes, is no more. In its place is a large, smoldering crater and no signs of a culprit. Subsequently the unlikely allies have agreed to continue their trek across the country, but with no particular destination in mind. In their first issue under temporary writer Adam Beechen, it doesn’t take long for the tribe to run into some unexpected fireworks. Just one page, in fact, but the ensuing battle doesn’t last long. But much as I’m no fan of brainless action sequences just to kill time, in retrospect I think I’d have preferred it to stretch the length of the entire issue. It certainly would’ve been preferable to the weak attempts at a backstory and limp-wristed character development segments that followed. Beechen does little to differentiate each member of the team besides a brief showcase of his or her powers. He doesn’t reveal anything new about the cast, lend them any depth or give his readers a reason to get interested in learning more about them. They stroll through the issue like husks on a clothesline, floating blandly from one dull, over-explained predicament to the next without so much as a yawn’s worth of personality. Beechen’s partner in crime, Cruddie Toran, offers his finest J. Scott Campbell impression. At first glance, it’s a decent enough approximation – abundant curvy women with long, thin fingers, unusual paneling and abundant blast lines – but upon closer inspection his shortcomings grow obvious. Not that Campbell’s take on the characters was without its own flaws, but at least at the time it was something original. Toran’s illustrations take an already-excessive style and amp it up even further, casting aside any concerns for storytelling or organization along the way. They’re a collection of pin-ups that just so happen to contain similar characters in an analogous environment. His work is the embodiment of style over substance, and it’s not even particularly good-looking at that. Think what you will about his work in the mid ‘90s, but at least Campbell could draw two different kinds of characters: long-legged, gangly supermodels and thick, chunky, over-muscled bodybuilders. Toran struggles with the latter, often sketching them in laughably effeminate poses with the same tiny, dainty little legs as their counterparts. And of course, everyone’s muscles remain rigid and fully clenched at all times. This is the very definition of a throwaway issue. The team bumps into a few Wildstorm regulars, fills the audience in on their whereabouts, diffuses a bomb or two and moves along. There’s nothing memorable about it, nothing inside to change or even define the characters it supposedly embraces. The story does little to excite and the artwork doesn’t help its case. Skip it.